Note: A source is now telling us that Groupon’s actual valuation is $4.75 Billion on a $950 Million Raise. According to a VC Experts report, Groupon gave the State of Delaware a heads up on its new funding on December 17th with an Amended/Restated Certificate of Incorporation. The document showed the authorization of an up to $950 million round of Series G preferred stock says VC Experts. While this doesn’t necessarily mean the company will be raising that amount, it does give it the capacity to do so. The report says to expect a SEC Form D with the exact amount of financing to be filed next week. “There are a few key differences in terms and pricing between the Series G and its Series F, raised in April. The $135 million Series F, led by Digital Sky Technologies, was priced at $32.12 per share and was junior in liquidation preferences to all preferred shares. This round is priced $.53 less, at $31.59 per share and is senior to all. According to VC Experts’ estimate, the new round gives Groupon a “best estimate” valuation of $6.4 Billion. The filing has reportedly also increased Groupon’s authorized voting common shares to 250 million and if all of them are issued at $31.59 per share could mean that the company is valued at over $7.8 billion. VC Experts says it will release the Amended Certificate of Incorporation filing tomorrow morning to its email distribution list. We are currently looking into it and have contacted Groupon for more information as well. The entire document is now available for download on the VC Experts site. PDF below. Fortune’s Dan Primack is reporting that Groupon was talking to a Boston-based equity firm before the Google acquisition talks and that the same firm might also be leading this round, which he posits at way lower than the reported $950 million. 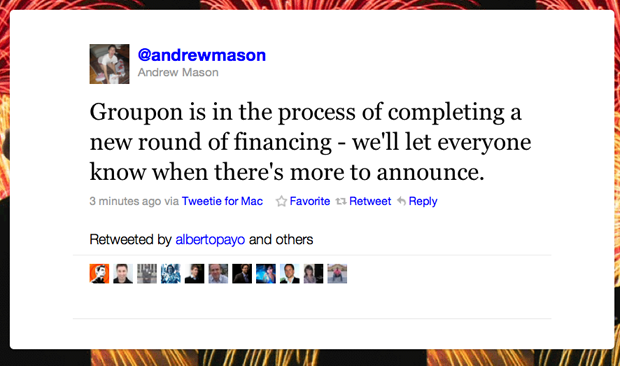 Groupon CEO Andrew Mason confirms that Groupon is indeed in the middle of a financing round with, what else, a tweet.